Thermo Fisher Scientific has received a coverage proposal from the Centers for Medicare & Medicaid Services (CMS) for its Oncomine Dx Target Test, a multi-biomarker non-small cell lung cancer (NSCLC) diagnostic, as part of a national coverage determination (NCD). The NCD covers next-generation sequencing (NGS) in vitro diagnostic (IVD) tests that include Oncomine Dx Target Test. The multi-biomarker non-small cell lung cancer (NSCLC) diagnostic is designed to identify patients who may be eligible for treatment with one of three FDA-approved targeted therapies for the disease. The three approved therapies are: AstraZeneca’s Iressa (gefitinib) for EGFR L858R and exon 19 deletion; Novartis’ combination of Tafinlar and Mekinist (dabrafenib and trametinib) for BRAF V600E; and the Pfizer/EMD Serono (Merck KGaA) co-marketed Xalkori (crizotinib) for ROS1 fusion. Oncomine Dx Target Test is designed to detect 368 variants in 23 cancer-associated genes clinically associated with NSCLC—three biomarkers validated for selection of relevant targeted therapies (EGFR, ROS1, or BRAF), and twenty additional genes, relevant for NSCLC pathogenesis analytically validated for variant detection from NSCLC tissue. In May, Thermo Fisher announced a partnership with Agios Pharmaceuticals to develop an NGS-based CDx for ivosidenib (AG-120), an IDH1 inhibitor currently in a Phase III trial (ClarIDHy, NCT02989857) for the treatment of patients with advanced IDH1m positive cholangiocarcinoma. Upon validation of the CDx, Thermo Fisher said, it will submit a supplemental premarket approval application to expand clinical claims for the Oncomine Dx Target Test. More recently, Thermo Fisher launched a similar CDx development collaboration with Blueprint Medicines to additionally develop and commercialize Oncomine Dx Target Test as a companion diagnostic for Blueprint’s’ Phase I BLU-667, with the goal of identifying RET fusions in NSCLC patients. The proposed coverage determination extends as well to clinical trials that meet a specific set of criteria—including the NCI-MATCH trial, which uses a standardized NGS protocol developed with Thermo Fisher's Oncomine reagents and Ion Torrent sequencing systems. CMS is expected to issue a final policy during the first quarter of 2018 following public comment of the preliminary NCD. He cited statistics from the American Cancer Society noting that 2/3 of NSCLC patients are over age 65, and average age at diagnosis is 70. Oncomine Dx Target Test uses a single sample to deliver multiple biomarker results, in order to minimize the risk of depleting tissues and requiring additional biopsies. Results from Oncomine Dx Target Test are presented in a single, two-part Clinical Test Report that incorporates NSCLC biomarker results, associated therapy indication(s), and other biomarker results. 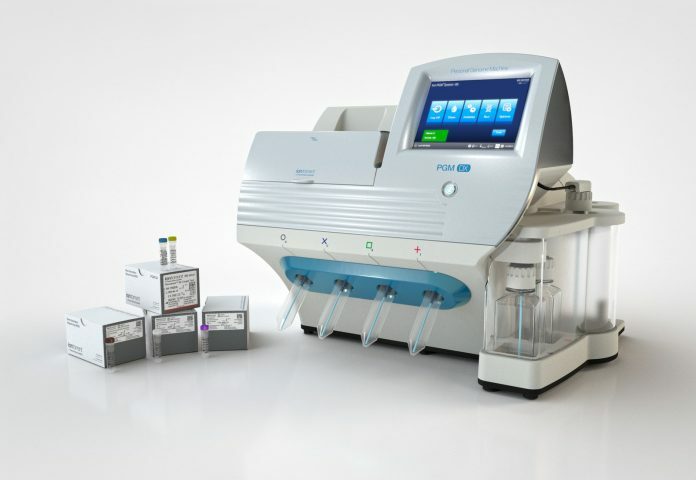 According to Thermo Fisher, total workflow turn-around time is 4 days from sample extraction to clinical test report. The Oncomine Dx Target Test was approved by the FDA in June as the first authorized companion diagnostic test to screen for multiple NSCLC therapies simultaneously, cutting from several weeks to just days the time physicians needed to match patients to FDA-approved treatments. Oncomine Dx Target Test is already available nationally and can be ordered by physicians through Thermo Fisher’s partner labs, including Cancer Genetics, LabCorp, and NeoGenomics. In October, the test received a positive coverage decision by Regence BlueCross/BlueShield, making it available to plan beneficiaries in Oregon, Idaho, Utah and select counties of Washington. “We are in active discussions with several national and regional payers to ensure that Oncomine Dx Target Test is both covered in the management of late-stage NSCLC—and successfully managed through the pre-authorization programs specific to diagnostic testing and therapies in oncology,” Dumanois said. Oncomine Dx Target Test received its proposed NCD from CMS on December 7, days after the agency issued a proposed NCD covering Foundation Medicine’s FoundationOne CDx and other next-generation sequencing (NGS)-based IVDs for Medicare beneficiaries with advanced cancer—including recurrent, metastatic, or advanced Stage IV cancer—who have not been previously tested using the same NGS technology and continue to seek further cancer therapy. Should that proposed NCD be finalized, Thermo Fisher’s test would be one of five NGS diagnostic tests that would qualify for coverage, a CMS spokeswoman told Clinical OMICs. Memorial Sloan Kettering Cancer Center’s MSK-IMPACT (Integrated Mutation Profiling of Actionable Cancer Targets), a 468-gene panel designed to detect gene mutations and other critical genetic aberrations in rare and common cancers. In November, MSK-IMPACT became the first tumor-profiling laboratory-developed test (LDT) to win FDA approval.